CUT NIC 8 HOLE CIGARETTE FILTERS. BEST QUALITY! 100% MONEY-BACK AND 100% SATISFACTION GUARANTEES • Blocks almost 90% of the TAR entering your lungs. • Does not change the taste of a cigarette. • Reduce cough, sore throat, shortness of breath. • Minimize stains on teeth and fingers. • Polypropylene Plastic is %100 SAFE for human health. ADVANTAGES OF CUT NIC 8 HOLE SUPER FILTERS OVER OTHERS • The polypropylene plastic is very solid and long which makes it easy to hold and smoke. • Cut-Nic filter is clear-cut so you can see it working from your 1st cigarette. Regular use of Cut Nic Cigarette Filters will reduce your coughing, harsh feeling of throat, soreness of throat caused by smoking. Use it regularly to minimize stains on teeth and fingers. Cut Nic Super Filters does not take away the pleasure of smoking. Cut Nic filter will trap the tar from each cigarette. Use it up to 4 to 6 times until it all the tar is trapped. • Use it regularly to minimize stains on teeth and fingers. • Use it regularly to reduce cough, harsh feeling and soreness of the throat. • 8 carefully placed holes on the bottom of the yellow filter captures most of the tar without taking the taste or pleasure of smoking away. TRY AND COMPARE! YOU WILL BE AMAZED! BUY NOW! 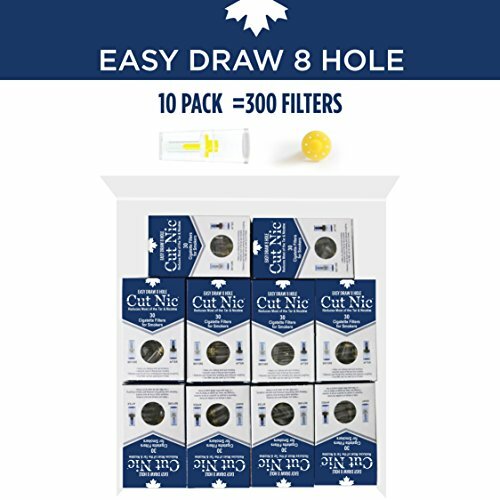 Cut-Nic Plus 8 hole design cigarette filter for easy draw smokers. Regular use of Cut-Nic filters reduces coughing and shortness of breath, relieves sore throat. If you have any questions about this product by Cut-Nic, contact us by completing and submitting the form below. If you are looking for a specif part number, please include it with your message. TarBar 5 Packs, Cigarette Filters Compare with Nic out, Tarblock or Tarstop.